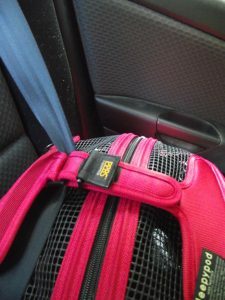 Has your pet’s carrier or harness been successfully crash tested so you KNOW it is going to effectively keep your pet safe in an accident? 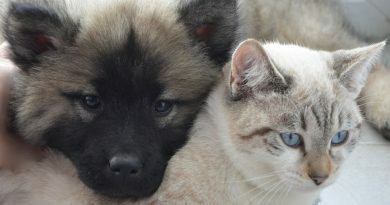 There are many carriers and harnesses on the market that claim to keep your pet safe in an auto or RV accident. However, there’s only one company who can make the claim of testing its pet safety restraints successfully at U.S., Canadian, AND European child restraint systems standards. That company is Sleepypod. I was able to get my hands on a Sleepypod Mobile Pet Bed, a Clickit Terrain harness, and a Clickit Sport harness. After looking at each one thoroughly, I realized just how different these are compared to others on the market. Many other companies claim they test their products for safety. Don’t be fooled. If they were tested at all, they were not successful tests and the crash test subjects (fake dogs) came out of these harnesses or crashed through the side of plastic carriers. Not what I would want for my dog or cat, so I’m going to stop using our plastic carrier in the car. 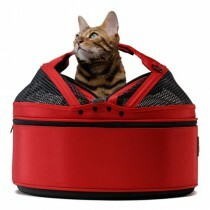 The Sleepypod Mobile Pet Bed is made of durable material called luggage grade ballistic nylon. Even the mesh on the top of the carrier is strong, but soft. The zippers seem to be heavy-duty, yet easy to zip. I would describe this mobile pet bed as user-friendly. It was easy to set up and ready for use in a matter of minutes without reading the directions. That said, I don’t recommend this because you will want to get everything set up correctly so your pet is confined safely inside. If you follow the included directions, you will definitely get it right. Strapping it in the car using the seatbelt is super simple. The PPRS Handilock mechanism on the handle keeps the handle from coming apart and the seatbelt from slipping out from under it. The hook and loop handle on the front of the carrier keeps the seatbelt in place around it. This carrier is not going anywhere when buckled in. People who RV will appreciate that this mobile pet bed is not only a safety seat but an everyday pet bed as well as a carrier. RVers keep their rigs from getting cluttered by using multifunctional items such as these. 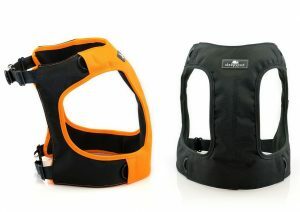 The Clickit Terrain is a solid, well-made harness and seems to be made from the same material as the mobile pet bed. It has what they call “shock absorbing sleeves” to protect your dog’s limbs. I really like how the padded vest is broad and secures a dog’s entire torso and how the metal buckles seem strong. When used as a seat belt, you simply thread the car or RV’s built-in seatbelt through the sleeves, across the back of the harness, and buckle it. I found that it is really easy to use. 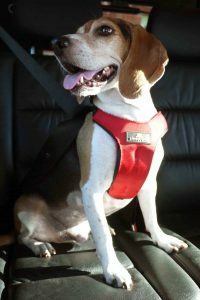 Sleepypod made this harness multifunctional just like the mobile pet bed, which we RVers love. 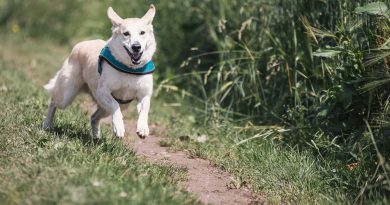 They created the Clickit Terrain so that consumers’ dogs can comfortably wear it as a regular harness for daily use as well as on long hikes. Additional packs called the Terrain Pack, can be added to the harness and you can also change out the reflective patches for custom or service dog patches. The Clickit Sport. Image courtesy of Sleepypod. The Clickit Sport is a lighter and more narrow harness but still has the safety features like the Clickit Terrain. Sleepypod created the padded vest and “Infinity Loop” webbing design for strength and comfort when using it as a seat belt. 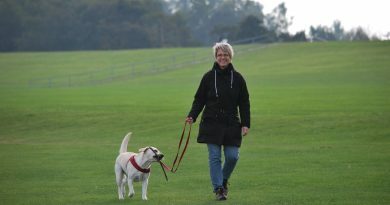 You can use this harness daily for walking your dog just like the Clickit Terrain. I think it is nice not to have to buy separate harnesses for different activities. RVers really do appreciate items created with more than one purpose since the space we have is so limited. One thing I don’t like is that many small dogs cannot fit into these harnesses because the sizes just don’t go small enough. I assume, however, that Sleepypod would rather you put your small dog into one of the mobile pet beds or another of Sleepypod’s carriers and buckle them in that way. If you want to see how Sleepypod tested the products mentioned above, please watch their videos. They show how their crash-test dummy dogs and cat were used and how each product did in the crash tests. Also check on the Center for Pet Safety’s website to get a non-biased view of how Sleepypod products performed. 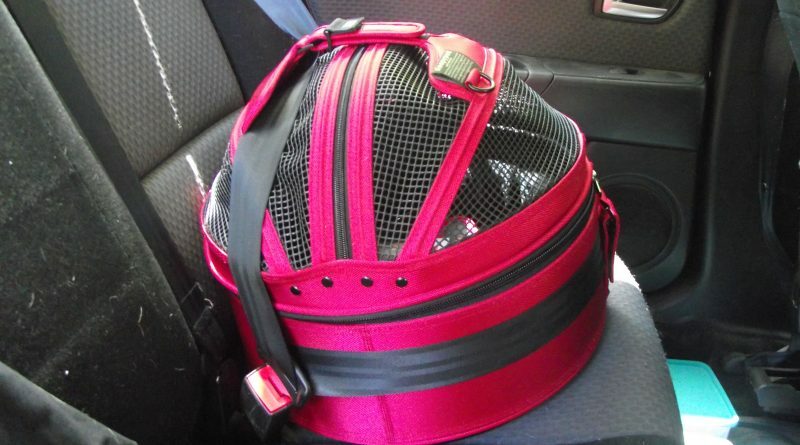 How do you keep your pets safe while traveling?